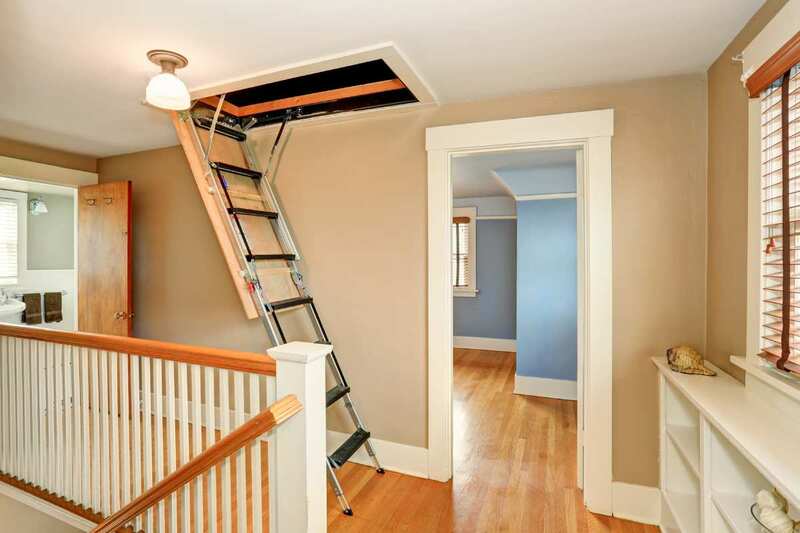 There are two main destinations for going up a ladder hatch – the roof or your home attic. These are of course used for very different reasons! Typically a ladder hatch leading to an attic would be used to move items you’re looking to store away for a later time. There are multiple styles and functions for these ladder hatches which we will review here shortly. Ladder hatches leading to a roof are typically found on large industrial buildings, condominiums, hospitals – basically any building where there may be a need to evacuate up instead of down or where there is a consistent need to access a rooftop. The following will help identify the uses for ladder hatches and break down some of the options available on today’s market. There are a wide variety of ladder hatches available on the market for use in the home to give access to the attic and having access to an attic for use as a bonus room or for storage space adds value to a home. By creating ladder access, it helps keep the area secure while it also helps lower heating/cooling costs since this area doesn’t need to be maintained the same as the rest of the home! The most common style of an attic ladder is one that is combined with a hatch system. Typically, one would access an attic by a set of wooden or metal pull down stairs that are often concealed in the ceiling. The hatch itself can come in any size but typically will be large enough to fit a full grown adult at a minimum. Once the hatch is lowered the steps are usually brought down to floor level, and the individual can climb up and down. If an individual is planning to use a ladder hatch often, they may want to look into ones that are built from metal or a more durable product. There is also the need to look at how much weight might be put on the ladder itself. If an individual is planning on carrying heavy boxes as an example up and down the ladder, it’s essential to take that into account when choosing a proper system. For the rare situation where you may need to have added security to the attic, you can consider ladder hatches that offer interior locking systems or an alarm system. For roof hatches the ladder provides convenient and reliable access to roof areas. Every ladder installed should be designed, constructed and installed correctly to ensure the safety of everyone using it (and it must be able to withstand the weight loads that it could be subjected to). These ladders could be of use for multiple reasons but the two primary ones are for a safe exit should an emergency arise or for general maintenance/work that needs to be done on the roof area. These ladder hatches are made of corrosion resistant materials able to withstand the elements. All ladder hatches leading to the top of a building must meet minimum fire codes as well. Steel Roof Hatches: These are the most common access to a roof are made from heavy-duty steel. They are designed to stand up to heavy foot traffic. Fire Rated Floor Hatches: Typically found in commercial and industrial settings where fire rated hatches are required. Aluminum Floor Hatches: These are the primary sturdy choice for a ladder hatch. Many different surface materials can adhere to the surface. Recessed Floor Hatch: These fit the design of the room and allow the fitting of flooring directly to the surface to fit in seamlessly with the surrounding floor surfaces. If you are a homeowner (or even a builder) looking to install a ladder hatch be sure to check with all building code requirements. Frequently there will be weight minimum requirements and fire rating requirements so be sure to check into it before installation!